We have the ability in this country to address air pollution and global warming. It isn’t just a nuisance. It makes things so dirty that it kills people, animals, water, and soil worldwide. Much of the material in this blog comes from a paper published by the Donora Historical Society and Smog Museum commemorating the 70th Anniversary of this disaster. Please consider visiting the museum. It suddenly became clear. Not only was the livestock industry threatened by a deteriorating environment, but i, my children, my students, my fellow citizens, and my entire country would pay the price. The connection between the symptoms of environmental degradation and their causes — deforestation, devegetation, unsustainable agriculture and soil loss — were self-evident. Something had to be done. We could not just deal with the manifestations of the problems. We had to get to the root causes of those problems. The Donora Works of American Steel and Wire Company stretched nearly three miles along the western bank of a horseshoe bend in the Monongahela River twenty-five miles south of Pittsburgh. In the early hours of Tuesday, October 26, 1948, a temperature inversion silently settled over the Mon Valley steel town of Donora, Pennsylvania. Combined with the sulfur trioxides and fluorine gasses pouring out of the Zinc Works into the stagnant atmosphere, the stage for a disaster was set. By Wednesday, October 27, visibility was as limited as anyone could remember and people were having difficulty breathing…..
Blinding smog opened people’s eyes to the mortal dangers of air pollution. It gave rise to local, regional, state and national laws to reduce and control factory smoke and culminated with the nation’s Clean Air Act of 1970. The commemoration of the 70th Anniversary of the Donora Smog Disaster, the deadliest air pollution incident Ibn U.S history will go largely unnoticed and unappreciated outside a select group of educators, historians, journalists, environmentalists and dwindling number of aging locals who can still recall the horrors of that Halloween week end. Subject: Camp White Pine Requesting Support! Since Camp White Pine was formed in early February, our goal has been clear: to use this strategic location to put our bodies in the path of the Mariner East 2, an Energy Transfer Partner’s pipeline, to prevent its completion. Since then, we have maintained a continuous treesit on the pipeline easement to defend against the natural gas liquids pipeline they want to pump through these wetlands. We have publicized our efforts and hopefully inspired many along the pipeline route that resistance is possible. Our civil disobedience has not been taken kindly by ETP or the Huntingdon County Judge, George Zanic. In April, Judge Zanic granted ETP a writ of possession – an unprecedented step in eminent domain cases – giving them the rights of a property owner over the easement on the Gerhart’s land. Six days ago, they took it a step further and got Judge Zanic to grant an injuction demanding a halt to our treesit and authorizing the police to arrest all who stand in the way of ETP’s construction efforts. But we will not be deterred by the unjust actions of ETP and the local judicial system. Instead, we will stand in the long tradition of those who have disobeyed unjust laws to uphold a much higher authority. AND WE ARE ASKING YOU TO HELP US. We need support and we need bodies willing to stand in the path of corporate destruction and face potential arrest. Our tree climbers are going to be in the trees risking their lives to stop ETP’s pipeline construction. We need folks on the ground willing to risk arrest to protect our tree climbers and stand against ETP’s destruction. ETP and their private security, TigerSwan, are attempting to smear us as violent extremists for simply living in trees to defend them from being cut down and killed. In reality, we are here to stand nonviolently in defense of our earth and our future generations. 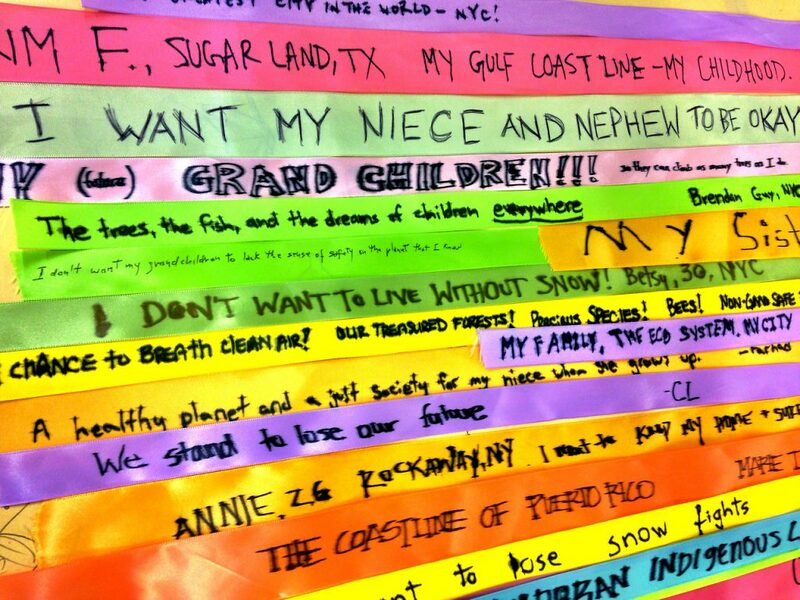 The more people who come to support us in nonviolent civil disobedience, the more effective we can be at combating their narrative and showing that there are many people willing to risk arrest to stand in the way of their destruction. People gonna rise like the water, we’re gonna shut this pipeline down. It reminds us of the urgency of our choices and the effects they will have on future generations. The time is now, all we have is each other and the power of love. The oceans are rising, so must we. P.S. Please share with trusted contacts and peace/faith/justice groups that might be interested in supporting!! We are at a crossroads. Climate change calls for the mindful presence, compassion and action. The name of the Encyclical is Laudato Sii (Praised Be You), is taken from St. Francis of Assisi’s “Canticle of the Sun”, a prayer praising God for Creation. The subtitle will be Italian, Sulla cura della casa comune, “on the care of the common home”. People of faith and spirit around the world will be mingling prayer and mindful actions. We are continuing and building practices that can make a difference. Together we can inspire our leaders to be bold, and protect our future as we and they prepare for the Paris Climate Talks in late November-early December. As you can see we will be offering many activities. 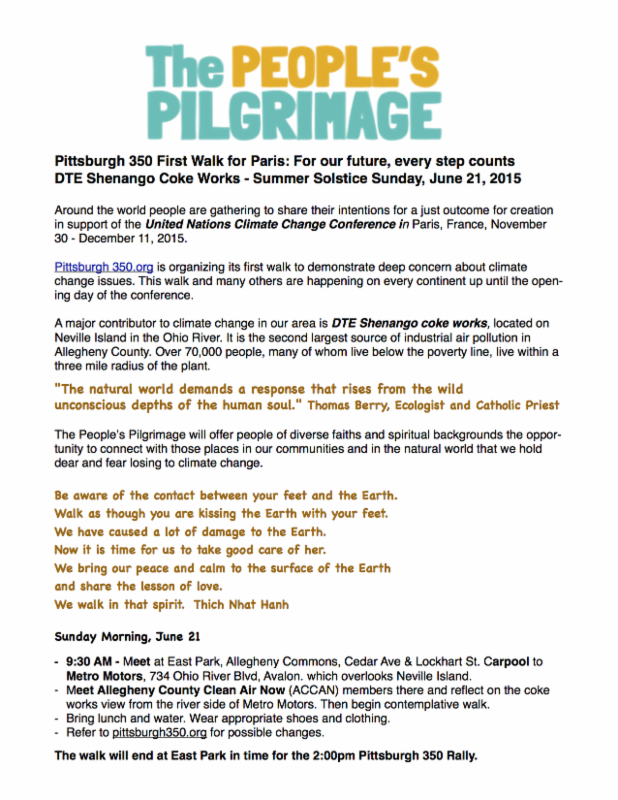 June 21 will find us participating in the Pittsburgh 350.org Rally for Climate Justice on Summer Solstice Sunday. The morning of that We will begin with the first People’s Pilgrimage, a Walk for Paris. Our hope is that everyone will organize a series of mini-walks to or around the places you love, the places you are concerned about, remembering that around the world people are loving and caring for a region, a place, a family. Peoples Pilgrimages is a wonderful resource for prayers and meditations from around the world. Sunday, June 21, 2 – 3:30 pm. East Park, Allegheny Commons, Intersection of Cedar Ave and Lockhart Street, North Side. There are two opportunities to demonstrate your concern about the climate crisis: a morning walk will connect climate change to air pollution from a Neville Island coke plant. In the afternoon there will be a Climate Action rally on the Northside. ACTION: Bring your friends, family, neighbors and fellow workers to learn and demonstrate about the climate crisis. Bring your hand-made signs and after the rally join the sidewalk procession over to the fountain at the Point. *Music provided by the Squirrel Hill Billies. *Reading of the Pittsburgh Climate Action Day Proclamation – Councilman Dan Gilman *Introductions and Opening Remarks – Patty DeMarco (Institute for Green Sciences, CMU) and many other interesting speakers. Description of the Problem and thoughts from local campaigns working on Solutions. Sidewalk procession from Allegheny Commons to the fountain at the Point. To RSVP or for more information contact Peter Wray at pjwray@verizon.net with ‘Climate Action Rally’ on the subject line. 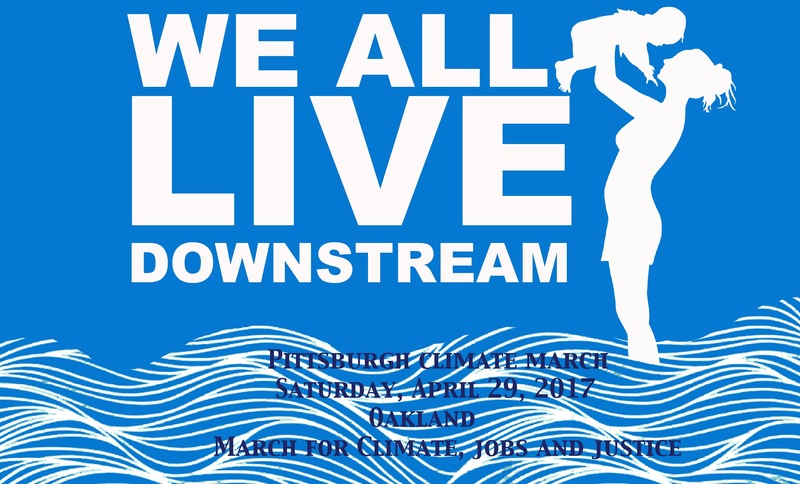 Sponsored by the Thomas Merton Center, Pittsburgh 350.org, and Penn Environment. Panelists will address global and local challenges posed by the encyclical. This important letter is expected to raise difficult questions about climate change, our relationship to creation and our responsibility for care of the Earth. Come and be part of the conversation on Thursday, July 2, 7 pm, at the Episcopal Church of the Redeemer, 5700 Forbes Ave, Squirrel Hill. 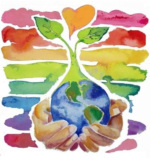 Participants will apply study of eco-theology to congregational advocacy for climate change action. This eight session series will begin on July 9nd and run through October 15th. All events will be held at Church of the Redeemer in Squirrel Hill. Thursday July 9th and 23rd, August 6th and 20th, Sept. 3rd and 17th, Oct. 1st and 15th, from 7-9 pm. Inhabiting Eden:Christians,The Bible and the Ecological Crisis. To see why this book has been chosen please visit this book preview. For information, or to register for the series only, please contact Wanda Guthrie, Church of the Redeemer (wanda.guthrie@gmail.com ), Claudia Detwiler, Community House Presbyterian Church (cdetwil@earthlink.net). You do not need to register for the July 2nd Papal Encyclical session. Series discussion leaders are: Wanda Guthrie, Church of the Redeemer, Claudia Detwiler, Community House Presbyterian Church, and Dr. Randy Wiesenmayer, 1st United Methodist Church of Pittsburgh. City of Pittsburgh Go Fossil Free! Give a LIGHT – TO CHANGE EVERYTHING WE NEED EVERYONE!